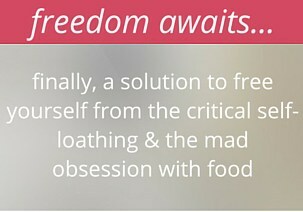 Are you plagued by the “I hate seeing pictures of myself” syndrome?? 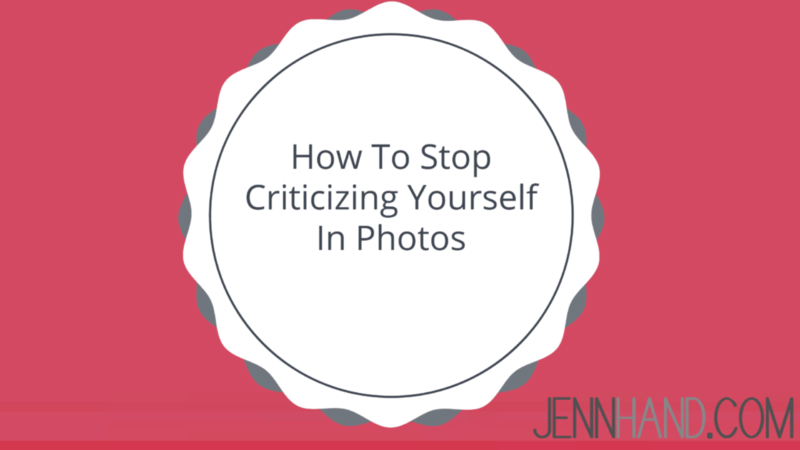 Today, I’m diving into how to stop criticizing yourself in photos. Do you look at every single picture you take and scrutinize your flaws, analyze your imperfections, criticize your faults, then sigh, and think that you’re just disgusting and there’s no hope for you? Well, my dear, I have a new way for you to approach looking at photos of yourself. I used to agonize over every single pic of myself. I’d notice my hair that was flipped out in a weird way, my nose that seemed crooked, my one tooth that was sticking out, my skin which looked awful, my stomach that looked fat at that angle…and on and on it went. Even now….I like my body (for the most part), I’m comfortable in my skin (most of the time), I don’t hate my stomach like I used to (98% of the time)…and yet, I STILL look at almost every single picture of myself and dissect it. I had this happen again when I got very casual engagement pictures taken last weekend. All of my old “I have to look perfect“, “I need the perfect outfit”, “It must be from this angle”, “No, that picture is awful” tapes were rearing their ugly heads. At first I got angry at myself for having come “so far” in my own body image journey and still catching myself having these mean thoughts about myself. And then I realized it was a beautiful lesson to see what was coming up for me to heal: how to love myself on an even deeper level. It is crazy to me how negative I can become when looking at pictures of myself. I have to be photographed from my good side. My hair has to be in an exact place. I have to do skinny arm. My leg has to be angled a certain way. Goodness gracious, it’s just a single photo! Who knew photos could cause such self-loathing, such a “well I’m in a bad mood now” and such STRESS? I think we can all use a good dose of re-thinking how we look at ourselves in pictures. Let’s create a movement where every single photo we see, we notice what’s BEAUTIFUL about ourselves! Imagine what our world would be like if that was our first thought about seeing a photo? To start moving down that path and to stop criticizing yourself in photos, keep these 3 things in mind. When you’re dissecting, scrutinizing, analyzing, and picking apart every single aspect of yourself that you hate in the picture, you’re only looking at one part of the whole. You’re pinpointing something so specific (especially if you’re zooming in to see how you look), so minuscule, and so particular, that you are missing out on the full effect of the photo! Observe the picture from a bigger perspective. Glance at it like you would if you were just browsing, taking mild interest in what was going on in the photo. Refuse to let yourself “go there”-don’t start honing in on every single, little detail that you think looks awful about yourself. When you begin to focus on the big picture, what the FULL you looks like (instead of just one specific part that you criticize), you’ll start to see yourself in a new light. No one else is looking as closely as you are at yourself. When you look at a photo, are you even looking at the other people in the picture? Usually, you’re so engrossed in thinking you look fat, wondering why you wore that unflattering outfit, or criticizing the zit you think looks huge, that you’re not even looking at anyone else in the picture! And the same goes for others looking at the photo. People quickly glance at it and move on. No one is picking apart and analyzing you like you are. It’s just a snapshot, a moment in time. No one is even NOTICING half of the things you notice about yourself in the photo. So the next time you’re anxious about hating what you see, remind yourself that no one else is even seeing HALF of what you’re seeing about yourself. 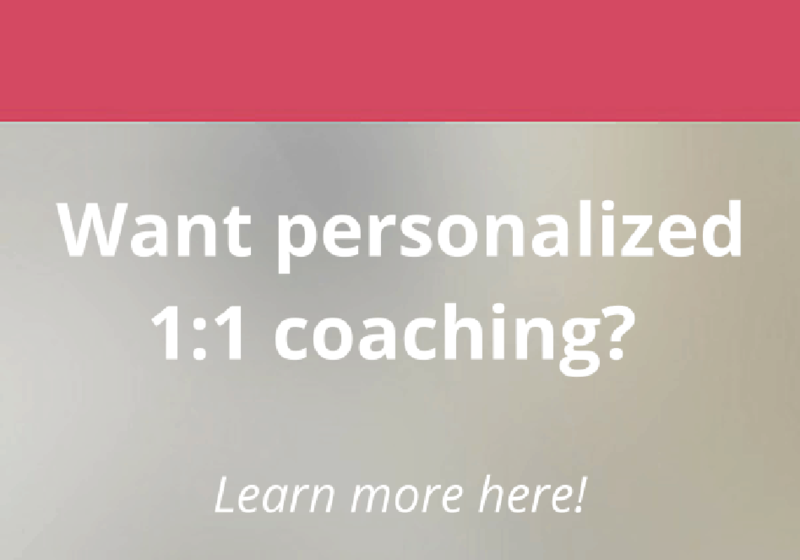 Look at, feel, and remember your experience. What was going on that day and in that moment? Did your friend who you’re posing with say something hilarious that made you laugh right before the picture? Did you experience some crazy, awesome moment that you were dying to capture on film? Go beyond what YOU look like and think about the experience you were having. Fill yourself up with the amazing times you were having in the moment that picture was taken. It will change the way you look at photos. I remember being on Semester at Sea (best 3.5 months of my life!). I was knee-deep in disordered eating and I can literally remember where I was in my restrict/binge cycle when I look at every picture. It pains me to think that I’m remembering “yep, that’s when I was at the gym for hours and trying not to eat” or “that’s when I was binging and couldn’t get a handle on my weight” instead of the unbelievable, crazy adventures I was going on. When I look at pictures, I consciously remind myself of the EXPERIENCE (instead of thinking about how I looked and what was wrong with me). I close my eyes and picture the trip up the Great Wall of China, the laughter of my friends playing board games on the ship, or the simple happiness in the children at a school I visited in Vietnam. Because, after all, what we are really longing for IS the joy of that memory, that moment, and that experience. It’s your turn now…can you look back at a photo you once hated and go back and tell me what you see with new eyes (using these tips!). Share in the comments below. 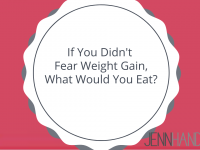 If You Didn’t Fear Weight Gain, What Would You Eat? 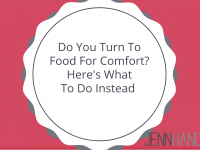 Do You Turn To Food For Comfort? Here’s What To Do Instead. 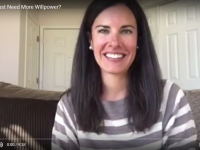 Think You Just Need More Willpower To “Fix” Your Food Issues? Love this post! I especially love #2 – it’s true, nobody is as concerned as you are with every flaw that you seem to notice. I remind myself of that every time I see myself on film! Thanks for these reminders! Pictures from Christmas are the poorest victims of our loathing – haha! It’s the time we spend with our family and of course, the worst time to take a picture because of all the eating! However, I love your last tip which is to remember the moments – which are always the best moments of the year! Thanks, Jennifer! Yep, we think everyone notices our flaws, but really it’s just us 🙂 Glad it resonated with you! Great post and reminders about photos and life. 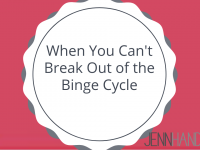 Fantastic reminders, Jenn! It’s so easy to slip into being critical about ourselves, especially in photos. Today was the exact perfect day for me to receive this email. Thank you. I have two issues with Photos. Current photos where I dissect my face my body my clothing My hair you name it. My second issue is coming across photos of myself when I was thin or straight sized. I can stare at those pictures for a long time lamenting and grieving that I no longer have that body. I have not yet done the exercise but when I get home and have photographs to look at I am definitely going to try this. As perhaps one of your older readers (58 years on the planet) I appreciate this post very much. It’s easy to look back and see how thin I was as a much younger woman and criticize how I may look now. What I’ve learned is that our bodies grow in cycles. We think we’re grown when we’re 25; fully formed and set in our weight. Actually there are so many more morphs we will experience out of natural cycles! 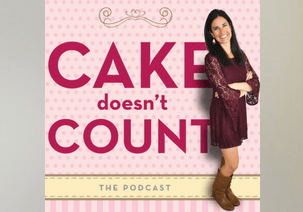 Pregnancy, postpartum, periods of extreme fitness and periods of maybe some slacker time. Periods of time when we just don’t have time to worry like when we card for aging parents or a sick child and have no time to even worry about how we look. The time we take to look a certain way or maintain an unrealistic weight robs us of time we could spend living and loving and caring. As a teacher and mom the kids in my life don’t care about the extra ten pounds I carry and hate. They care that I love them and that’s it. When they want my picture taken with them, it’s my obligation to not be so critical of it or pose so specifically for the best angle of me! It’s to give them the feeling of love they felt for me to want that photo In the first place. Thanks for the great reminder that it’s the event and the happy memories from it that should bubble up when we look at photos not our criticisms of ourselves. We have to get away from being so selfish. I love this!!!! 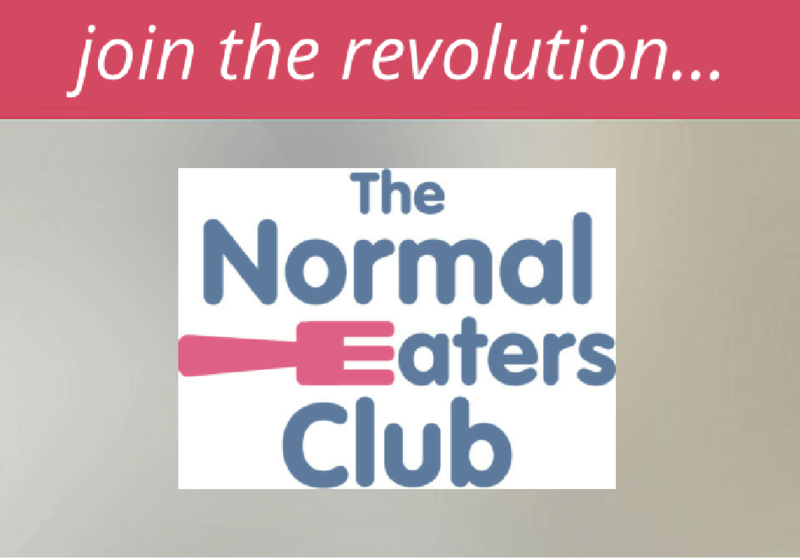 Mindy in the Normal Eaters Club did this, as well 🙂 Posting a photo to help start to heal and see yourself as others do 🙂 YOu’ll have to keep us updated on how it’s going! 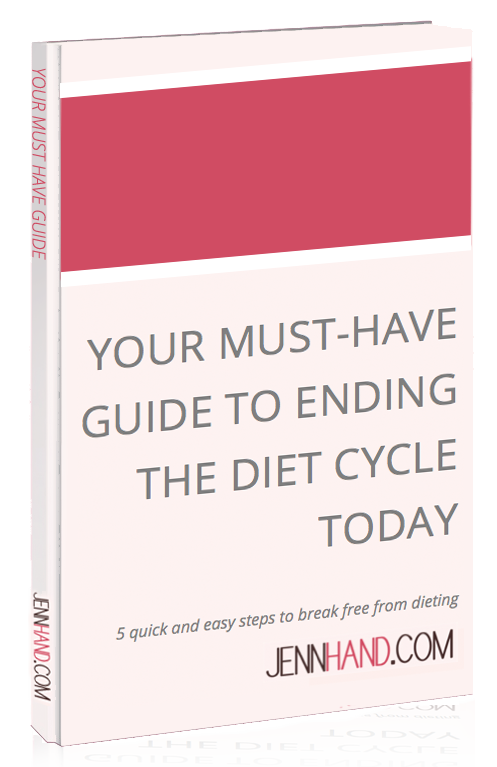 Get Your Must Have Guide to End the Diet Cycle Today" FREE!